Great alternative rock band before the term "alternative" was even invented! 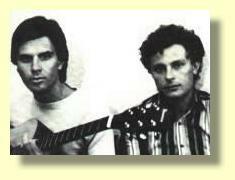 Formed in Cape Town in 1978 by 2 cousins, Allan Faull and Nielen Marais (Faull and Marais... Falling Mirror... geddit?). The Hawns & Dendles is a spooky, double-story mansion in Ravensburg Road, Newlands. It is 1970. Down the passage lives mad old Uncle Edward Faull and his mother Anne. Granny Anne Faull has been charged with the almost hopeless task of policing two of her most troublesome grandchildren, Allan and Nielen, the black sheep of the Faull and Marais families. Allan's father Louis and Nielen's mother Meg are siblings and their mother Anne is the families' last resort for keeping these two first cousins in line. It's hard after all these years to be totally objective about thiswonderfully eclectic band, I was, and still am, very passionate about theMirror. I first heard them as a young twenty-something in early 1979, theywere my third signing as an A&R man (after Baxtop and Lesley Rae Dowling)and I was completely blown away by the sheer vision lyrically and musicallyof Allan and Nielen. I was often criticised both internally by WEA and bycertain media for continuing to release album after album with very littlecommercial success, but I believed in my heart that this band was specialand one day people will recognise that. To me the Mirror were, like the AsylumKids, pioneers... trailblazers in a country at war with itself, they were, Isuppose, our Pink Floyd complete with a Syd Barrett genius type and aguitarist that, in any other country would have been up there withKnopfler, Clapton (who he idolises by the way), [Jeff] Beck, etc.